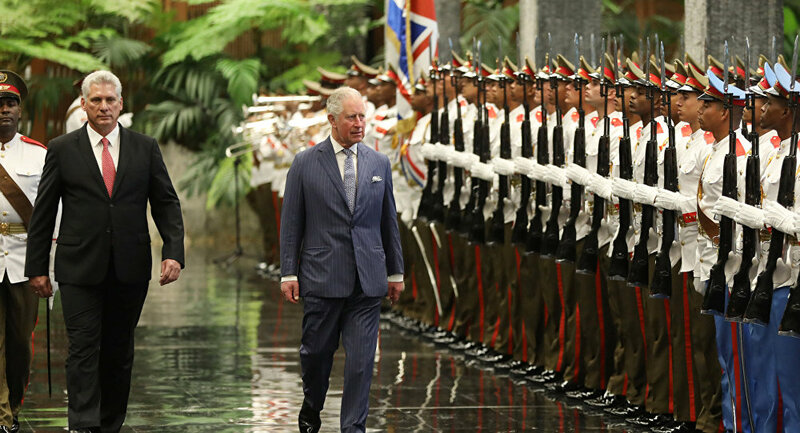 The British royals met President Miguel Diaz Canel and his wife, Lis Cuesta Peraza, at the Palacio de la Revolución on Monday. The couple walked by a Guard of Honour at the President's office, where they were greeted by the Cuban head of state. The pairs were then serenaded by national anthems from Cuba and the UK and then sat for a bilateral meeting, with an official dinner hosted by the Cuban state following shortly after. The royals will attend on Tuesday a British classic car exhibition and visit Studio 101, where Cuba's most famous musical group Buena Vista Social Club recorded their top albums. Despite criticisms over the state visit, UK ambassador to Cuba Anthony Stokes said Monday night that the UK and European Union have a "very strong policy of engaging with the Cuban government". "We believe that is the right way — not only to talk about the more difficult issues, but also to identify ways we can work together." Mr. Stokes added that it was a "very special moment" and that Cuba had "never seen anything quite like this before", adding that President Obama had visited in 2016, but the "royal visit is something really special". No British royals have visited Cuba since 1959, making Prince Charles and Duchess Camilla the first in 60 years. President Diaz Canel also paid reciprocal visits to Britain's Clarence House last November. Cuba was named by US national security advisor John Bolton one of the "troika of tyranny" along with Venezuela and Nicaragua in November, but despite tensions with the US, European nations maintain strong bilateral ties to the Latin American island state.